Semantic markups are counted amongst the most important aspects of high quality Psd to Html conversion or Html5 development process. Even web developers are giving more preference to the semantic HTML. Nowadays, people have embraced semantic markup as a cornerstone of Web development which surely leads to better accessibility, internationalization, interoperability as well as search ability. We developers have explained semantic codes as the piece of markups that are widely used to add a meaning to the website’s content in well defined manner. The semantically coded markups plays a great role in making the content of a web page readable all Search Engines Spiders. Truly speaking, the clean, error-free and semantic XHTML/HTML5 mark-ups are the foundation of a successful website that cannot be ignored especially from SEO point of view. 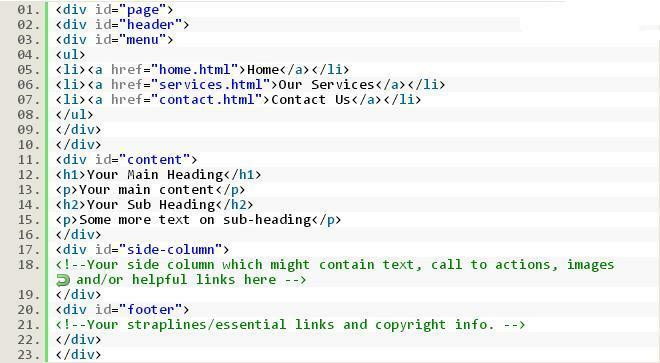 WHAT IS SEMANTIC HTML MARKUP? The term semantic markup is usually referred to the practice of using the correct tags or elements of HTML/HTML5 for better content labeling. In the web development industry, the “semantic markup” has been recognized as a practice of using element types properly their meaning to mark up content in the document. The key motive of using semantic coding is to make the website code structure user-friendly for readers. Here, readers can be common human beings, web browsers, or platforms. Just give a thought that why do you write HTML using the <h1> tag and the <p> tag? And, avoid using <div> and <span> tags. The reason is simple – <p> say “this is a paragraph” and <h1> says “this is a heading at the first level.” In this way, these semantic HTML/HTML5 tags give better meaning the content. To some degree semantically-correct HTML help in keeping the content more organized and structured. <p> element for a paragraph. <ol> element for a sequential list. <blockquote> element for a large text block quoted from another source. The advent of HTML5 – the new version of Hypertext Markup Language brings us many new elements for documents and applications, enabling us to extend the current capabilities of HTML. Elements like <header>, <footer>, <nav>, <section>, <article>, <aside> are some interesting tags that come along with HTML5. User-friendliness : It is the biggest advantage of using semantically-correct HTML markups. Such codes are easy to use, clean and more readable. The semantic HTML codes can be easily edited in the future. Better Accessibility : It is another important area of a web page that can’t be ignored. The semantic codes play a great role in enhancing the overall accessibility of a website.It also helps in conveying the better meaning without compromising the accessibility od code structure. It is quite obvious when you properly code the elements of your web pages such as titles, headings, paragraphs, and lists with semantic codes, you’re actually making the site more compliant with the accessibility guidelines followed by the web browsers. Lighter Code Structure : The light weighted Semantic HTML styled by CSS codes help in enhancing the downloading speed of the site and make web pages load faster. The fast loading website is the good practice that can make the web page more accessible amongst the users as well as serach engines. Semantic HTML codes can help you in enhancing the search engine position of your website by simply making your site easier for software to read the content. It all works on the simple principle that each and every major search engine follows. Some people consider this trechnique as “white hat” Search Engine Optimization (SEO) under which the HTML cruft are removed from your page and only important codes that are properly describing your content will be kept in the code structure. It helps the search engines to render what your site is really about quickly because of the fact that you have semantically optimized your page. Remember, the <p></p> paragraph tag pair which are most commonly used to indicate a paragraph. Some web developers use these tags for creating space to a web page. It is wrong. Neve use a series of <p> tags for the purpose of creating space. When it comes to semantically-correct code structure, avoid using the HTML tags <b></b> for bold and <i></i> for italic. Instead of using these HTML tags, you can use <strong></strong> and <em></em> (meaning emphasis) which represents the same meaning of text bold and italic, giving a meaning to the content structure. It is always advisable to separate style from content. Web developer should try to avoid use of HTML tags to apply presentation because of the simple fact that it is the job of Cascading Style Sheets (CSS).